Who are these stupid people that make up these stupid laws? It is inconceivable to me that a majority of our elected officials are so stupid that they can all agree on this one. Here is the scenario: I have an external mailbox, attached to the stucco of my house, near the front door. Yesterday I saw a person distributing flyers look through my mail before he left me his own flyer – in the mailbox, by the way, which is also against the law. If I had not been looking out the window, I would not have known that there was an unidentified person looking through my mail, and, further, I could not have known whether he took anything in that mail box. I called a handyman to come to my house today to put a mail slot in my door. That way the mail would come directly into my house. Do you know what that handyman told me? He told me that it was AGAINST THE LAW to put in the slot; that unless the slot was already in the door, the mail carrier will not recognize it and the mail will be taken back to the post office. What the hell does that mean “he will not recognize it?” Do I need to put up a sign with an arrow indicating that “this is a mail slot?” And directions as to what goes into the mail slot? I am trying to protect myself and I am told that the mail carrier won’t recognize it? So…I called the post office and it was verified: that unless the slot was there before this stupid law (“stupid” is my word) the carrier will not use it. I said I was going on vacation for a month and I wanted to make sure my mail was safe. I was told I could put a “hold” on my mail and pick it up at the post office when I return. What if I return after 12:00pm on Saturday, or on Sunday for that matter? I can’t have my mail until Monday? What a crock that is. And is there no chance that the post office may lose my mail too? I have to read “1984” again. I think that story has come true! Curious as to whether this is a city, county, or state law re the mail slots? When I broke my leg a few years back I couldn’t get to my mailbox to fetch the mail. I called the post ofc and was told that I could request to have the mail deposited AT the front door by completing a special form, but if I did get permission, the only way the carrier would leave the mail there was **if** there was a “basket” of some sort. I ended up using the lid from a box of copy paper and that sufficed until such time I could get to where the mail box is located. There’s this new thing called the internet and it has online bill pay and you can send something called email. Perhaps true, but does that make the situation any less stupid? I have 9 grandchildren and 4 great grandchildren. As an example, I buy them savings bonds every birthday and holiday. I want to be able to hand them their bonds when they reach 21 – or when the bonds mature. I don’t want to use the internet – I want mail delivered to my house. And…of course, it is not new for I have been doing it for years, and years, and years. Not all mail consists of bills. Perhaps that’s all you receive, but there are a variety of types of mail, or snail mail, if you will. My friends still send birthday and Christmas cards, in addition to the other holidays. That’s just one example. First you took on the skunks and now you’re coming after stupid laws that make no sense. I love your articles; you have a very clear, no-nonsense way about you and I like it. I love getting your emails, Sarah. They certainly tell me that you have the same sense of humor I enjoy. I have this horrible feeling that I will learn more about the post office than I ever wanted to know – and I will keep you informed! If you are disabled or elderly (whatever the age is), see if you can get a waiver from ADA. It must be California, because we are applying for a mail slot in PA for our new house. Mail delivery is to clustered boxes scattered around the complex. But our neighbor has a mail box next to her front door. So I checked with the local post office. We need a letter from our doctor to attest to the fact that both me and my husband’s knee problems make it necessary to have the mail delivered to our house via a mail slot. I don’t know if this requirement is for the Commonwealth or the federal government. Good luck. so what about the guy who went through your mail? you just let him pass to go through your neighbors’ mail? If you have a relationship with your mail carrier, I’m sure he or she will be more than happy to put the mail in your mail slot. I installed one at my house in my wall, not the door- my mailman of 4 years had no problem with it. Funny what a little friendly conversation will get you. A while back in OB I was involved in a fender bender, the cops were clearly willing to leave without filing a report, and so was I but the other driver, the driver at fault, couldn’t read between the lines and wound up paying for everything though we all tried to help her out. Many of these laws are silly but only stand in our way if we let them. I believe that a felony was committed when the flyer was placed in my mail box.The fact that he read my mail is also against the law. I reported those incidences also. I just keep coming back to the comment that “the mail person will not recognize the slot.” That’s why I suggested that I put a drawing with a mail slot and a hand delivering mail to the slot in the door. But could I describe the “flyer person” – not on your life. 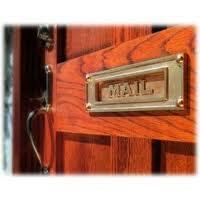 Mail slots are usually narrow, while mail can often be bulky. So carriers often have to take special pains to force mail into a slot. Their time is already stretched thin, hence their anti-slot perspective. When we moved to North Park in January, we took over from an occupant that had lived in the house over 20 years, and still got mail through the slot. When the mail carrier found out the occupant was moving, the carrier demanded that a mail box be installed for the incoming tenants (us). The mail carrier said he would not deliver mail to us unless the mail box was installed. So what did you do, Shane? Capitulate and put in a mail box? Were your civil rights violated? The person before you could do it; why not you. The P.O. lady said that if the slot was already in the door it could stay – at least that is what she told me. She didn’t tell me what I had to do if the person before me had the slot and I had to change it. Guess I am getting a new list of questions to ask. By the way – are you renting? Did you pay for the new mail box, or did your landlord? I had a mailman pick up a water hose and begin to swing it at my wife and dog. My wife was asking the mailman to meet the dog and there were 6 kids playing in the yard. Of coarse the dog went nuts. I went to the post office and told the postmaster there that I wanted to file a formal complaint. I was told that I could file it and then pick up my mail at the post office for the rest of my life. The US mail is NOW a private franchise and no longer part of the government except government guaranties and outlandish federal dollars spent. I will give suggestions: If your mailman commits a crime (as mine did) call the POLICE and make an arrest. Do not try and file at the PO. If you need to talk to the postmaster about ANYTHING, turn your phone to record and record audio and video…it does NOT matter if the camera does not see his face except in the beginning . Leave it running and recording. These people believe they are above the law and that what they say goes. IT is true, UNTIL you have them on recording threatening you. I had a conversation with my mail carrier yesterday and she actually prefers a mail slot as long as it’s at least 36 inches off the ground. I’d suggest you just talk with your carrier and, if he/she is agreeable, (and they probably will be) go ahead and install the slot. It probably has to do with liability, entering front yards, and the never-ending dog/postman love saga. How about we sacrifice 1000 lawyers to the volcano for every idiotic law that gets passed? It’s they who create such nonsense…last I checked. I think I’d rather sacrifice the politicians that made this rule than the lawyers. I have plenty of firewood for the pyre! Hey Bill Ray – last I checked, it was politicians who are elected who make these silly laws – not lawyers (per se). Just a little defensive back at ya. Yeah, Frank. I agree. We have other reasons to bash the lawyers! Back in May of 2000 (!) Dawn, my 6 foot, 200 pound postal carrier told me that she was not going to deliver my mail unless I got rid of my “dangerous weeds.” In that particular May, the nasturtiums I had planted in the front of the house were pumping out their beautiful green umbrellas, and their lovely yellow and orange flowers in an exuberant late spring burst that reduced my three foot wide concrete walkway to the house to a mere path. Dawn had to walk that path to get to the mailbox on the porch. I said “Dawn- these aren’t dangerous weeds- they are nasturtiums! You can eat them in a salad. Want some?” And Dawn said she wasn’t delivering another piece of mail because there were spiders in those weeds. The possibility of spiders, since there weren’t any spiders to be seen- dangerous or otherwise- rather floored me. Now I am positively fascinated by my City Heights post office. I am struck by the kindness and patience of the workers there who speak all kinds of languages, but never enough of them. And I have learned so much from the 35 people that always stand in line in front of me. Because of my PO I know how many envelopes you can send to your family member in jail; I realize that we don’t all share the same sentiment of what constitutes a reasonable “container” to send all the way to the other side of the world, to Vietnam or Ethiopia for instance; and that the Filipino delicacy balut- a fertilized duck egg with a nearly developed embryo inside- does not withstand the test of time after weeks on the high seas. In the second week of June, I ripped out the nasturtiums which were turning yellow, and finally my mail resumed. I had failed to convince the guy next in charge to the manager to deliver my mail. But that is not the end of the story. My PO carrier Dawn finally got a transfer out of the ‘hood. When I ran into her a number of years ago at the downtown PO we embraced like old friends and got caught up on each other’s lives. I think my current PO carrier is swell, and the swing carrier, Saigon Jimmy, gives me little lessons in Buddhism along with the mail. Saigon Jimmy does not believe in killing anything or anyone for any reason. I smile at him, as he walks past the webs this year of the amazing number of argiope spiders that have taken up residence among the bamboo, and the orb spiders bobbing overhead. And I also continue to send Charles Bukowski’s book Post Office off to friends, because there is always more than two sides to every story. Ask for it at your local library! What a great story. How much it reads like fiction, but we both know that it isn’t; that given a little power – not “flower power – everyday service people can rule – and ruin – your life. And then comes along a service person in that same arena, with smiles, laughter, and knowledge willing to forge through the flowers, spiders, etc., that makes Dawn seem like like an ogre. (Or, if you will, a “scaredy cat! – afraid of spiders.” Wonder what she would do with the bird’s nest on the roof! Thank you Judy! You are so right that some of the unlikeliest people can rule and ruin your life. And I also must add that the unlikeliest people bring us insight and joy. Have ordered it from Amazon. Will be here on Tuesday. You probably didn’t keep the flyer that was dropped in your mailbox by the nosy delivery guy, but if so, call the company he was delivering for, and let them know; probably too late by now. Definitely enjoyed the dialogue, esp. annagrace, who is very savvy in so many areas based on her comments in other articles. What a wonderful story, Anna Grace! Judi, I hope they let you have your mail slot. I don’t think new laws should try to do away with them, but that is just my opinion. Best wishes to you both. Hi Nancy, You are right. I didn’t save the flyer. I had several that day – Monday – and was not sure which was his. Next time! Hi Annagrace, Received Bukowski’s “Post Office” today and will begin reading it right away. You are welcome. Got me through a rough morning! Finished the book last night. How funny – and how stressful. I was so glad to see that nothing was mentioned about mail slots! And…today the request to raise the price of stamps was denied even the post office is 3 billion dollars in debt! The book really gives some insight into the work-place violence at the P.O., doesn’t it? some of these ‘stupid laws’ (all REAL California law) are too funny not to mention here …. Thanks. I will. I stayed in the “California Law” stupids (? ), but it is comforting to know that other states have equally as stupid legislator’s running their states too! Judi, the anti-mailslot policy is certainly stupid, but if you tire of fighting it you can buy a locking mailbox that mounts on your wall much like your current mailbox at your local hardware store. The whole “mail slots are bad because some mail is bulky” line is bs. If you have an item too big for your mailbox/slot, the carrier can just drop a little post card in there that tells you to come pick it up at the post office. If the resident is prone to receiving bulky items, and they get tired of running to the post office, maybe they’ll replace their mail slot w/ a box… or small box w/ a bigger box. Thanks, Brian. I forgot about the locking mail box; had one years ago in another house. I think I have run to death this topic – now looking for another one as stupid as this one. But…I will pass on the info re: the mailbox to others that have contacted me. Really? The postal employee told me that if it wasn’t there years ago, it could not be added. Then Shawn – above several comments ago – said that he moved into a house that had a slot for the other tenants, but when he moved in the carrier told him he could not use the slot and he had to buy a mailbox. Interesting idea – I’ll check into it. you must have some really (“postal”) postal workers. (ha ha) but really, my postwoman is really nice. good luck in your endeavor. My postman is the greatest, also. The word about the mail slot did not come from him; came from the post office in the sky in OB. The sign idea is good. I might add that the sign be a neon sign. And….we could take it to our favorite jeweler and he could stud it so that as cars drive by it would sparkle. I like the idea of articles on “stoopid” laws. . .I say we all go find one and investigate accordingly. So, Frank. . .the Bar Assoc. once told me that these are still on the books “just in case” a prosecutor needs them to get someone on a technicality, etc. Is that true? Is there a minimum number of days that need to pass between hold orders? Can a person have a 30 day hold, have all that mail delivered at the end of that 30 days, have a friend go visit their house once to pick it up, then another 30 day hold start the very next day? Interesting question. It has now been posed to the post office and I was told that mail is only held for 30 days. Now, if it were delivered to your home after that time, and you were still not there, it would be out in the open for anyone to take. When filling out the form to hold the mail, it is possible to put on the form that xyzzzz zyxxxx will be allowed to pick up the mail at the end of the 30 days, but that negates the hold. A new hold would have to be generated by the person living at the house for after the first 30 days has expired. Does “up a creek” mean anything to you? And…in our new lifestyle, who wants mail anyway? Whoaaaa! Wait a minute. I’m in a similar situation — worse, ’cause I’m working overseas for two months!!!! The post office told me a 30-days hold is their limit. Now then, if new mail slots in front doors are “illegal” then how is it that they are today being sold by the thousands??? Check the Internet. Google mail slot and see what happens. BTW: Since the USPS has gone on the ‘Net you can issue a mail hold from anywhere in the world. I did. I talked to the carrier and she agreed that if there was a slot in the door she would use it – and she has. Too bad you have to circumvent the rules to get your mail delivered. What happened to ” . . . rain, sleet, snow”. I doubt its a postal law, and it cant be a local because its against federal law to interfere with the mail. I use to drive a contracted bulk mail route in the midwest back in the late 90s, and it was illegal for even the state police to pull us over for speeding because of the federal law. So of course mail haulers sped .. So if it is local, or community, or whoever making the law, you might refer them to the federal statute on interfering with the delivery of the US Postal service. It came directly from the post office in ocean beach. •The opening must be at least 1 1/2” x 7”. •Horizontal slots must have a flap hinged at the top. Vertical slots should be hinged on the opposite side from the door’s hinges. •If you have an inside hood for more privacy, the hooded portion shouldn’t be below the bottom of the outside plate on a horizontal slot. On a vertical slot, the hood shouldn’t extend beyond the side of the outside plate on same side as the door’s hinges. •The hood should not project more than 2 1/16” beyond the inside of the door. •The bottom of the slot must be at least 30” above floor. You may file a complaint by email, or by phone at (1-800-275-8777). Sometimes pets are a nuisance with the mail slots. The cat in this video defends it fiercely with hilarious results. I’m sure that likewise some dogs will destroy items that come through the slots.